Smaller than a robin, the male oriole displays a brilliant orange breast, shoulder patch and rump contrasted with a black head, back, wings and tail. The female resembles the male, but is paler in colour, displaying a dull orange breast with a dark brown olive colour on its head and back. The male has a beautiful flute-like song, which he performs throughout the summer. The female’s song, in comparison, is shorter and simpler. While songs vary slightly from one bird to the next, they always have the recognizable “hew-li” sound. Range: Baltimore orioles return from their wintering grounds in Mexico or the southern coast of the United States to their Canadian breeding grounds in spring. Their breeding range expands from Nova Scotia west to a small area in British Columbia. Habitat: They have a preference for deciduous trees and open areas and have adapted well to parks and suburban regions. Diet: While caterpillars form a large part of their diet, orioles also eat spiders, grasshoppers, crickets, beetles, butterflies, moths and fruit. Typically monogamous, males court the females once they arrive at their breeding grounds. Courtship consists of singing, chattering, hopping, bowing and tail fanning. Females build a new nest every year that hangs from the ends of tree branches. Favourite trees include willows, maples and elms. They lay an average of four brown- and black-speckled light grey/light blue eggs. Following an incubation period of 12 to 14 days, the nestlings hatch. Both the male and female feed the young for two weeks, at which point the young no longer require parental care. There is only one brood per season. Many larger birds and mammals prey on the eggs, nestlings and fledglings of Baltimore orioles. Because Baltimore orioles feed on caterpillars, they play an important role in protecting forests from pests such as tent caterpillars, fall webworms, gypsy moth larvae, tussock caterpillars and spiny elm caterpillars. 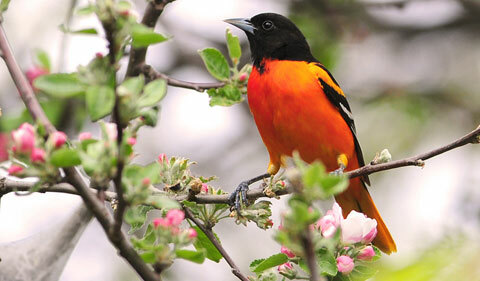 A favourite among bird watchers, the Baltimore oriole is a pleasure to spot in one’s backyard. To attract this beautiful bird to your yard, refrain from using pesticides, as this can kill off or contaminate the oriole’s main food source. If you have the space, grow one of their favourite trees for nesting or grow shrubs and other native plants to create additional habitat for insects. You can also grow fruit-bearing plants such as Rubus spp. (raspberries) and Prunus spp. (cherries) as another food source. To supplement, you can place orange sections and bananas on feeders. If Baltimore orioles are near, they will bring their young with them once the young are ready to leave the nest. 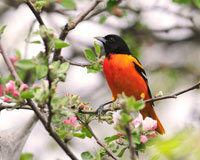 Perhaps this will be the summer that a Baltimore oriole visits your backyard.